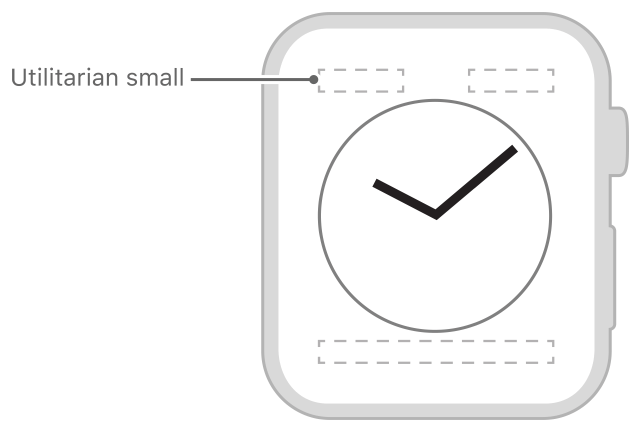 A small square or rectangular area used in the Utility, Mickey, Chronograph, and Simple clock faces. The following figure shows the size and location of the utilitarian small complication. The utilitarian small family can display the CLKComplicationTemplateUtilitarianSmallFlat, CLKComplicationTemplateUtilitarianSmallSquare, CLKComplicationTemplateUtilitarianSmallRingText, and CLKComplicationTemplateUtilitarianSmallRingImage templates. A small rectangular area used in the in the Photos, Motion, and Timelapse clock faces. A large rectangular area that spans the width of the screen in the Utility and Mickey clock faces.